Are you using Google Flights to its full potential? You may have used it when planning your last trip. The basic functions are pretty self-explanatory: enter in your destination and dates and it spits out the lowest airfare. But if that's all you do, then you're not making the best use of it. There are a ton of special tricks and features that allow you to really find the cheapest flight possible. We'll explain below. Rule of Thumb: Use Google Flights for simple one-way or round-trip flights. It's good for comparing airfare prices for different dates. But it doesn't show all carriers, like Southwest. So you'll also want to compare pricing on a couple of other sites. If you have a more complicated route, use ITA Matrix instead for finding the best fare. See cheap deals to different places in "Discover Destinations"
At the end, we also compare Google Flights to other popular flight search engines. We also give you expert tips to get the lowest fare. Get $500 off your next vacation: Google Flights is a great tool for finding deals on airfare. But if you have a special trip coming up, there are ways to save through points and miles. 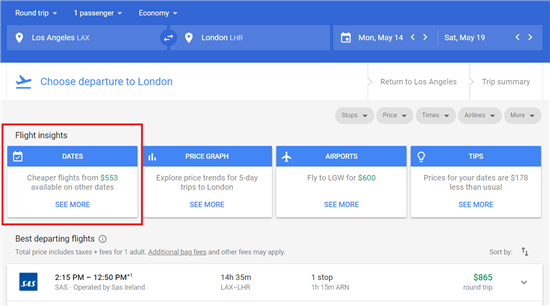 Let's dive into all the secret tricks Google Flights has up its sleeve. Spend just 15 minutes reading this guide, and next time, you'll know how to snag yourself the best deal. Bonus: Google Flights is a smart way to search for cheap flights. But did you know, you can travel for cheap with miles and points? Join our FREE travel course to learn how to travel the world with points. Incognito browsing: Before trying out our insider tricks, make sure to open up a new window in your web browser in private browsing mode i.e. "incognito". This enables you to see the lowest price possible. Otherwise, your browser search history might come into play and higher prices will appear. This tip goes for all online booking sites. Looking for Google Flights classic? Google Flights changed its interface in early 2018, but many people preferred the old classic one. Unfortunately, there is no longer a way to change it to the classic interface. But we have many tips for how to use the current one, so keep reading. Read on to learn how to use these tricks. Google Flights API: As of April 10, 2018, Google Flights has retired its QPX Express API service. This shutdown does not affect QPX for enterprise, which is the API service offered by ITA Software for larger partners. Smaller companies and startups can look into the Skyscanner API. This is the first step I take when looking for the absolute cheapest flight. If your dates aren't set in stone, you can play around in the Calendar view to see if another day has a cheaper flight. When you enter in your departing and arrival cities, a calendar will automatically pop up with airfare prices for each day of the month. It shows the cheapest price on each day. This allows you to see at-a-glance the best prices across the next 2 months. For example, let's look at a flight from Los Angeles to Chicago in May. The cheapest days will be shown in green. This works best for one-way flights. You can separately search the departing and return flights to see which days are best. 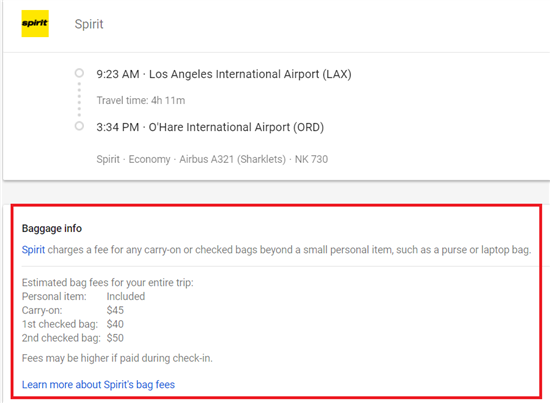 You can search round-trip too, but the prices may not be accurate for your needs, because the system randomly assigns a trip duration that yields the lowest price. Currently, Google Flights allows you to search and book for flights up to 331 days in advance. An error message pops up if you try selecting a date past 12 months beyond the current date. Looking for Southwest flights? 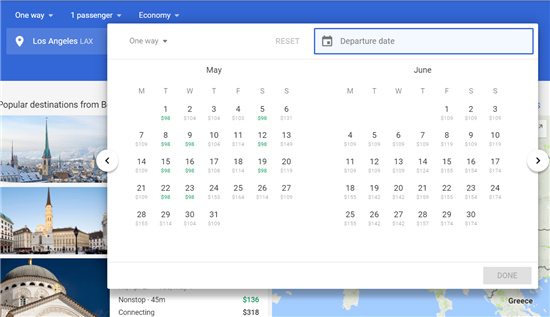 Google Flights doesn't publish Southwest prices, but if the route has Southwest flights available, you will be able to see a list of Southwest flights and times in the search results. If you select the flight, you'll be redirected to Southwest's website where you can see the prices. When you're searching for flights, you'll see a box called "Flight Insights" at the top This tells you if there is a cheaper day to fly. For example, I'm searching for a flight from Los Angeles to London, for the dates May 14 - May 19. For my dates, the best price is $865 round-trip. But Flight Insights gives you a tip that says there are cheaper flights from $553 on other dates. Under "Dates," you can see prices for all departure and return options in a grid. You have your departure dates going across the top, and the return dates going down. Looking at the chart, I can see that leaving one day later (on May 20) will save over $300. There's also an "Airports" tab that lets you see the prices to fly out of/into nearby airports. The "Tips" box has tips on things to do at the destination. Tip: Of course, make sure that this works out better for you overall. For example, it won't make sense to save $150 on airfare by returning a day later, but then also having to spend an extra $200 on a hotel room for an extra night. I love that Google Flights gives me the price of the lowest price ticket on each day of the month when I am planning to fly. It's fantastic if you are able to be flexible with your schedule as you can see if it will be cheaper for you to fly on a certain day of the week. One big worry about booking a flight is that you don't know if you're booking at the best time. If you wait a couple of days, and the price goes up, that's really frustrating. 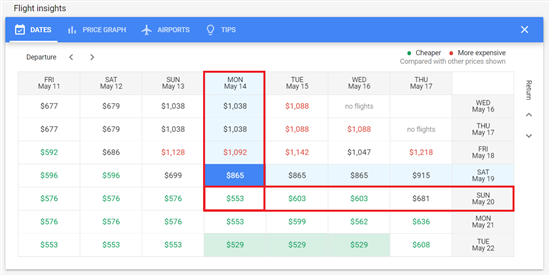 Google Flights helps you out by predicting price changes based on historical trends. If you're looking at a flight, and the fare is most likely to change, Google Flights Insights will tell you. On the desktop view, you will find this in the "Tips" box on the left. In the mobile interface, it will be displayed in a box directly under the search form. In the above example flight from Portland to Austin, it tells me that the price is likely to increase $20 in the next 5 days. This will give you more confidence that now is the right time to book. Are last minute flights cheaper? Last-minute or same-day flights can be a gamble. If you're flying a popular route, flight prices will most likely go up closer to the departure date - particularly if it's a popular business route, because airlines know that companies will pay big for business travelers. If the flight still has a lot of empty seats, the airline could slash the prices for a same day flight. If you are flexible with your destination and time, it's possible to find last minute deals. Google Flight's Explore feature is a great way to look for the cheapest flights. Feeling spontaneous? Have a long weekend and itching to go somewhere, anywhere? The Explore Destinations feature is a great way to look for a cheap flight to places you might not have thought of. On the home page, click on the Explore Destinations map on the right side. Just enter in your departing airport and dates you have available. Or you can enter flexible dates. It'll show you popular cities and lowest airfare on a map. You can zoom in and out to see prices to cities. In the above example, I'm looking for a 1 week trip in February departing from Boston. There are flights to Chicago for only $137 round-trip. Or to Atlanta for $108 round-trip. Score! The left side bar will also highlight great deals that are lower priced than normal. Using Google Flights from another country? Simply click the toolbar. At the bottom you will see a "Currency" and "Language" box that you can modify accordingly. You can search a broad region, such as Europe, South America, etc. And you also don't have to search for a specific date. You can just specify a month and general length of stay. In the date field, just select "Flexible dates." This is great for finding good flight deals to Hawaii. Let's say I want to take a 1-week trip to Hawaii sometime soon. The flexible dates feature allows you to search up to 6 months in advance. So I'd select "All" under "Flexible dates". 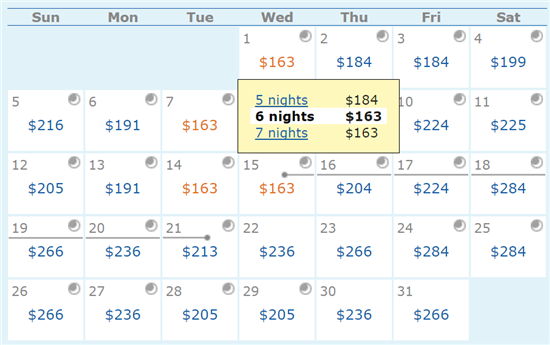 It tells me that in all of the next 6 months, going from March 14-21 will be the cheapest. A round-trip flight to Hawaii for only $300-something is a steal! $350 round-trip to Iceland or $480 round-trip to London are great deals! 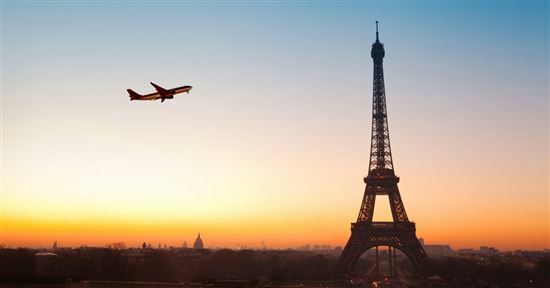 Cheap flights to Europe: This is probably the best way to get cheap flights to Europe. Just play around with different months and see what the cheapest flights are on the map view. You never know, you may even get ideas for cities you've never considered before. If you are planning for a trip a little bit further in advance, then you can afford to wait for prices to drop. This works if you have set dates for the trip. You can track a flight by switching on "Track Prices" at the top of the flight details. Google Flights will email you if the price drops. You can save as many different flights/itineraries you want. Then you can pick the cheapest among them for whichever one drops the price. Cheapest days to fly: In general, the cheapest days to fly are Tuesdays and Wednesdays. The most expensive are Fridays and Sundays. Red-eye flights are usually the cheapest fares you'll find. And if you're willing to take a connecting flight, you can reduce the cost by a lot as well. The best times to buy domestic airfares are between 1-3 months before departure. For international trips, you'll want to shop 2-5 months before departure. Google Flights is often my first step when planning for upcoming trips. I set an alert for my preferred travel dates and location, and then watch the alerts to decide when to purchase tickets. I like how easy it is to get an overview of which locations are most inexpensive during specific time periods, so I can narrow down my choices from there. But I've never tried purchasing tickets via Google Flights, because I usually use points and go straight to the airline's website. Google Flights added a new Travel Trends tool to help you plan ahead for holiday travel. This tool uses historical price trends to estimate the flight prices before holidays. For now, there are 25 popular holiday flight routes for Thanksgiving, Christmas, and New Years. Just enter your origin and destination cities, and the dates of your travel. The graph will show you the best time to buy your ticket for the lowest price. 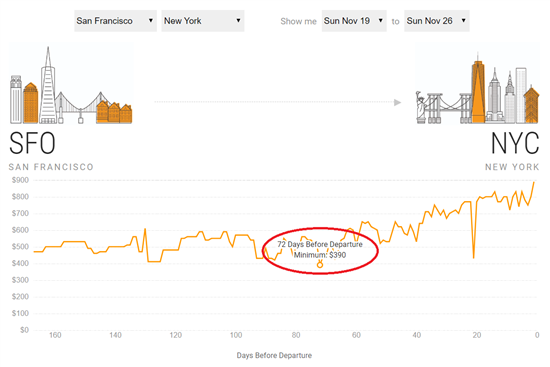 In the example above, for Thanksgiving travel from San Francisco to New York, the graph tells me that the best time to buy is 72 days before departure. The Travel Trends tool also shows hotel deals in top holiday cities. It shows hotels with the best balance between cost, availability, and quality. Google Flights doesn't have an app, but it does have a good mobile interface. If you're using Google Flights on your phone, there's a feature that tells you if the price is good or not. Currently, this works for holiday travel times (Thanksgiving, Christmas, New Years). If you scroll down, there's a graph that tells you if the flight price is low, typical, or high. This is based on historical data. In this example above, I searched for a flight from Los Angeles to Chicago during Thanksgiving. The graph told me that the fare is typical. It also said that price the is cheapest for these dates and will most likely go up. So now would be a good time to buy. Sometimes, it's cheaper to depart or land in another airport and then use ground transportation. Google Flights will automatically give you suggestions for nearby airports and the cost to fly into that instead. For example, flights from LAX to JFK are usually pretty expensive. But Google Flights show that if you fly into Newark instead, you can save almost $80. From EWR, you can take the Air Train into Manhattan at a very affordable price. You can search up to 7 nearby airports in the departure or arrival city. This tool comes in handy when you're going somewhere with a concentration of cities. Or if you have a few destinations in mind and want to see which one is the cheapest. Note: On a round-trip flight, if you selected another airport for your outbound flight, you can only select between the same airports on your return flight as well. For example, if I select LAX to EWR on my outbound, I cannot select JFK to LAX for my return. If you want the flexibility to choose your airport for both ways, then search individual one-way flights. The Multi-City tab allows you to put together a complex flight itinerary ideal for trips around the world and open-jaw trips. You can add up to 5 separate legs. For example, here is the sample itinerary. Multi-City searching won't have a calendar that automatically shows you the cheapest day to fly. However, you can manually adjust your dates until you find the best price. Next, you will separately choose the flight for each leg. Note that the price you see is the TOTAL price for all 5 flights. 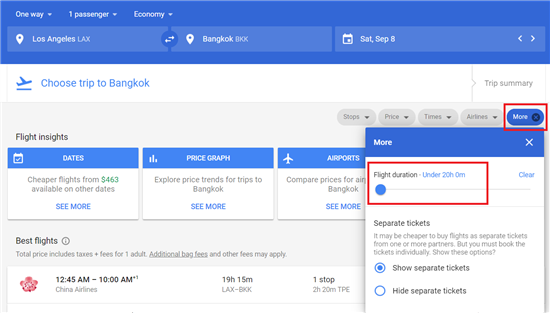 Google Flights will pull up the best prices for each leg of the trip and add them up automatically. After you've selected each flight, you'll be asked to book the airfares individually. It's typically less expensive as you can take advantage of the super affordable fares on low-cost carrier airlines such as AirAsia. 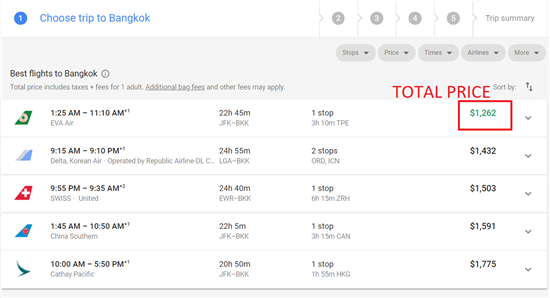 In this example, if you book the 5 flights separately, you can enjoy a multi-destination trip through Southeast Asia for $1276. If you select the Expedia link, you'll see that Expedia offers a similar itinerary for a whopping $10,233 if you book it together. It's a no brainer to spend some extra time to make each reservation separately. Traveling in a large group? Google Flights can search for flight availability and pricing for as many as 9 travelers under a single reservation. Duration filter: Say you want to fly from Los Angeles to Bangkok this September and spend no more than 20 hours in the air. Simply click on "More" and change the duration to what you are comfortable with. Time filter: This allows you to find flights options that best suit your schedule and preferences. For example, if you prefer to leave after 5pm on your departure day and after 3pm on day you fly home, adjust the hours accordingly and Google Flights does the rest. These tools are especially useful for business travelers who have fixed arrival and departure times, or travelers who want to avoid super long travel times. Mobile searching: Although Google Flights works best in desktop mode, you can also search and book flights on your phone or tablet the same way. It doesn't have the sleekest interface, but it gets the job done. Google Flights doesn't have an app. This one is for the air mile players. If you have an airline you're loyal to or you want to book partner flights within a certain alliance, you can specifically search for that. This is great if you have points/status with a certain airline or use a credit card that transfers points. Just go to the "Airline" pull-down tab and select your alliance or airline. You'll then see all flights within that network. Don't forget about baggage fees. A lot of low-cost fares or budget carriers may not let you carry on a bag. For example, basic economy fares on United and American Airlines only get one small personal item (like a purse of laptop bag) to carry on. Budget airlines like Frontier and Spirit also have the same restrictions. When you are selecting your flights, Google Flights automatically tells you the airline's baggage policy. You'll see the alert at the bottom of your selected flight, so pay attention. For example, here's the baggage fees info for Spirit Airlines for this flight. Note: Some airlines don't include overhead bin access in their fare. This is mostly for budget airlines, such as Frontier and Spirit. There is an option to filter your results to show prices with overhead bin access. That way, you'll know what the fare is to include carry-on. Do you use the Chrome browser on your desktop? Now you can see legroom and baggage restrictions for different flights with the Legroom extension. You just have to go to the google Chrome web store and add Legrooms for Google Flights. Once you've added this, on your search results, you'll see new columns for how many inches of legroom you get on the flight and whether or not you get carry-on luggage. In addition to showing the flight number and aircraft type, Google Flights gives you info about the flight features and amenities. It tells you the average legroom space, WiFi availability, in-seat power ports, and entertainment features. It's always good to know what to expect (bring an extra power bank if there's no in-seat power!). Below the in-flight details, there might be an advisory such as "often delayed by 30+ minutes" or "overnight flight". Make sure to take note of any text in red, especially if you have connections that need to be timed appropriately. After you've selected your flights (but before booking) you can share your itinerary. This is great if you are coordinating with a travel buddy or trying to find a flight for someone else. You'll find the "Send to yourself" or "Share" button right above your selected flight. This comes right before the booking stage. You can share with someone else via email, social media, or a link. Matrix by ITA Software is the granddaddy of all flight search tools. It was created by MIT computer scientists to find the lowest price among all airlines. Google Flights acquired the ITA Software in 2011 and uses it to power their flight search. You can designate a layover/stopover in a specific airport and say how long you want it to be. This is great if you want to visit family/friends in a certain place on the way. In Google Flights, they give you a list of layover options. You can do flexible departure and return plus/minus up to 2 days to find the cheapest options. You can see a calendar of prices and specify a duration of stay (for example: 5-7 nights). And the calendar will tell you what the round-trip airfare price is for each duration. You can see in-depth information about pricing, mileage and fare rules. You can see this on the "Itinerary Details" page after you've selected a specific flight. You'll get a breakdown of the airfare right down to the various taxes, fees and surcharges. You can also see if the proposed ticket is refundable/non-refundable and if there is a change fee should you have to change your travel dates. It's good to know the fare rules, especially the stopover restrictions, when planning multi-destination trips overseas. However, Google Flights is much more user-friendly. So if you're just looking for a simple one-way or round-trip flight, that's all you need. We love that Google Flights has a calendar of prices that automatically pop up. It's easier to see at-a-glance which day has the cheapest flights. And it also has fare tracking, which ITA Software doesn't do. Also, the ITA Matrix doesn't allow you to book flights directly on the website either. After finding the desired flight, you'll have to look it up on the airline's site, another online travel agency, or book through a human agent. Google Flights is more user-friendly in that it will take you directly to websites to book the flight you want. I was recently considering a trip from Detroit to Las Vegas. I quickly researched flights on Google Flights, which said roundtrip tickets started at $275. So, I bought show tickets in Vegas. Then I went to purchase the flights. Unfortunately, the only flight that was listed at the $275 price had a 27-hour layover—from Detroit to Las Vegas! So, I ended up actually spending almost $500 per ticket. Skiplagged was invented based around the trick called "hidden city fares." This basically means that you book a flight with a layover that is actually your final destination. So when you arrive at the connection point, you just leave the airport and miss the 2nd leg. This can help insanely reduce the cost. This is a flight that goes from Portland to Los Angeles, with a layover in San Francisco. If you notice, the PDX - SFO portion is the exact same time, same flight. But the "hidden city" flight is only $66. All you have to do is get off in San Francisco, leave the airport, and miss the flight to LA. You may be wondering: can you really just do this?? It's true that there's been some bad press and Skiplagged has even been sued. A lot of airlines prohibit hidden city ticketing, but it is not illegal to use. 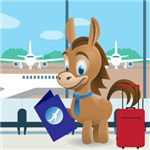 Be careful, if you use Skiplagged to book your ticket, you can only do carry-on luggage. You can't check a bag or else it'll go to the final destination on the ticket. And you can only book one-way tickets. Also, do not use your mileage accounts, because you can get penalized or even shut down if your program finds out that you missed a flight. Google Flights does not have this feature. So if you're okay with just traveling with a carry-on, it's worthwhile to check on Skiplagged if you can find a cheaper flight. Note that you cannot book any flights on Skiplagged. It merely finds the hidden city fare price for you. You'll have to go to the airline's site or another online travel agency to book the flight. Sometimes Google Flights will display two different carriers, and you have to book separately in order to minimize costs. While this is great, I always worry that I will book one and by the time I get to booking the other ticket, the deal will be gone. However, this hasn't happened yet. Momondo is one of the most popular online travel agents. It's known for finding the absolutely cheapest fares across all airlines, even the small budget carriers. For example, Google Flights doesn't have Southwest, but Momondo does. Keep in mind: One downside of Google Flights is that it may not have as many results as other huge airfare search engines, such as Momondo, Kayak, and Skyscanner. But Google Flights is expanding the number of online travel agencies they work with. 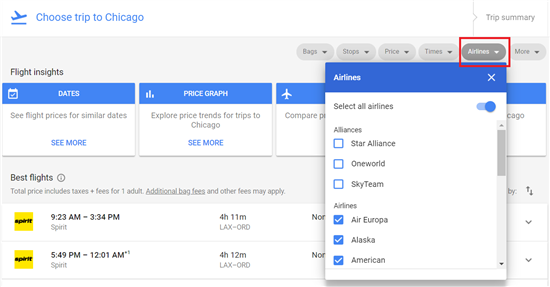 Google Flights offers bookings with Expedia, Orbitz, Priceline, and CheapOair. Usually, Google Flights return the cheapest price too. But we've noticed some instances where Momondo found cheaper flights. 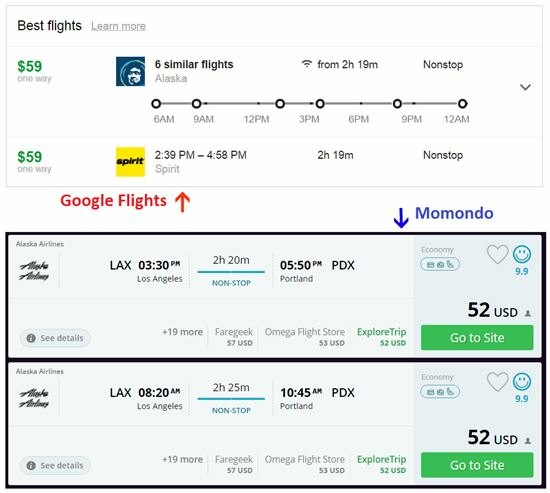 For example, for this trip from Los Angeles to Portland on April 12, the cheapest on Google Flights was $59, while Momondo's was $52. Its features are on the basic side, but if you're just looking for a simple trip, this site is a good place to start. And it's always smart to verify prices on 2-3 different sites anyway. Skyscanner: Skyscanner is another one of our go-to flight search engines. It has a lot of the same features, including a helpful calendar view of prices and "explore" feature. 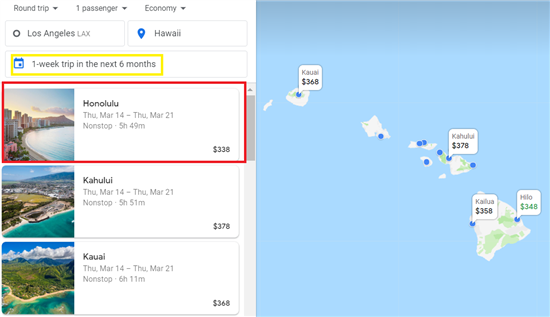 In some instances, Skyscanner can find slightly cheaper prices for the same route, so we recommend that you also compare Skyscanner prices before booking. Expedia: Expedia is usually able to come up with the lowest price. However, it doesn't show you the prices of different days on a calendar. Google Flights's calendar feature is much better for being able to pick the cheapest day to fly. What Expedia does better is its flight, hotel, and car rental packages. You can find a great deal by booking a bundle at once. Priceline: Google Flights and Priceline's pricing are very comparable. 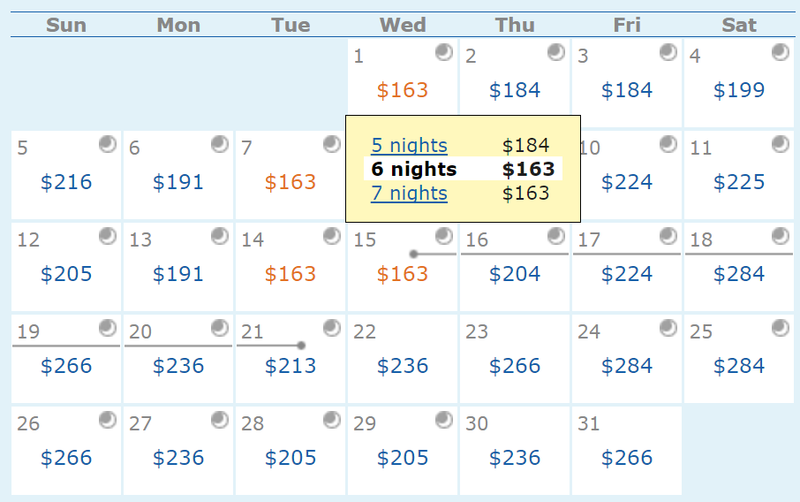 But Priceline doesn't have a calendar view. However, it also has hotel, flight, and car rental bundles that can help you save. Priceline is great for getting good hotel deals. It has a "Name Your Own Price" feature where you name the price you want to pay and Priceline will give you the first hotel that accepts your bid. Orbitz: Orbitz acts like a one-stop shop for your vacation. Besides flights, hotels, cruises, and car rentals, it also gives you deals on activities. It also offers vacation rentals as a more unique alternative to hotels. Generally, the flight prices are competitive to Google Flights'. Kayak: Kayak is one of the most comprehensive travel search engines. Usually, the flights and hotels are on par with other search sites, and you can save with their packages option. 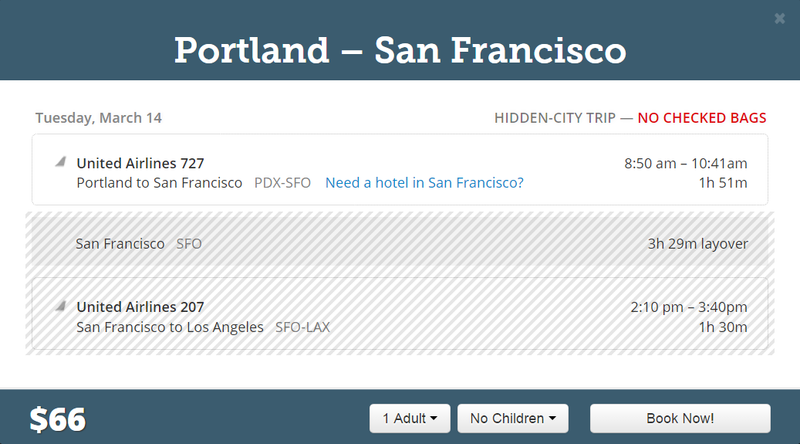 It also has an Explore feature that lets you see prices to different destinations. We also like Kayak for car rentals as they usually have the lowest price. 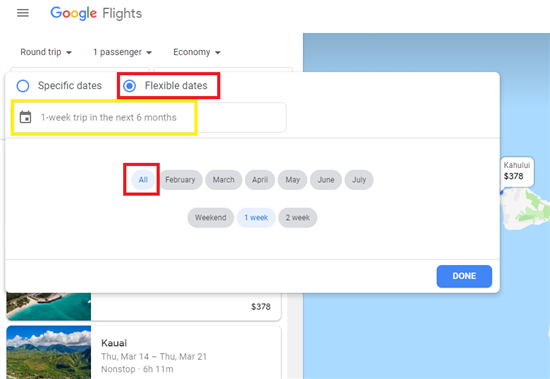 Most people may prefer Google Flights because of its calendar feature. 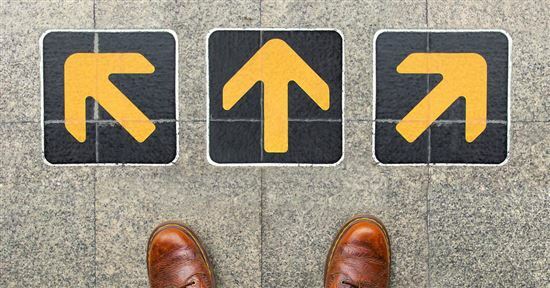 In general, it's a good first step to find which days are the cheapest to fly. Then we advise that you compare the pricing with 2-3 of these other travel search sites. Google Flights is one of the best flight search tools there is. It's extremely easy to use. Since it's powered by ITA Matrix, you can trust that it is finding the cheapest fare (usually). It has some great tools that make finding the lowest fare very easy so you can save some money on your trip. We recommend, though, that you compare prices with a couple of other sites, such as Momondo. We also love the Discover Destinations feature. It makes travel spontaneous and fun, and best of all, cheap. App Note: Google Flights is available in app form only on Android (under the app "Flights"). If you're using an iPhone or iPad, you can still use Google Flights on the browser. An advantage of using Google Flights on your phone is that it shows pop-up alerts when your fare is likely to drop or go up in the next couple of days. Google gets this information from historical data and trends. This helps you know whether you should hold off or book your flight now. Share on Facebook "Google Flights Review"